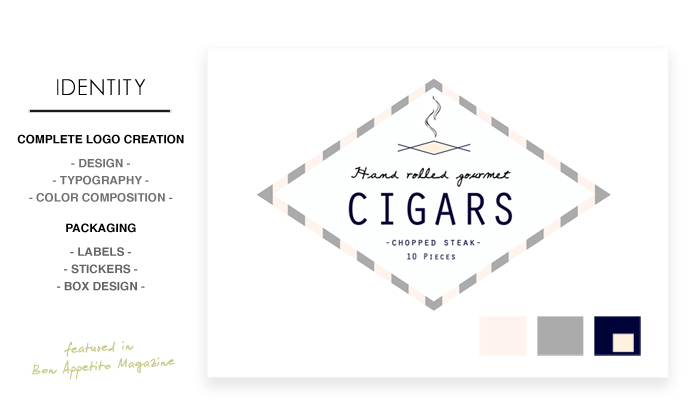 NYC2LA Media was brought on board to conceptualize and create an attractive logo for The Cigar Bar, an 'edible' pop up brand brought to life for ART BASEL in Miami Beach and various residential open houses in Sunny Isles, Florida. Printed napkins with the diamond designed logo allowed consumers to not only handle their food but hold on to a piece of advertising while they ate. Menus and whimsical placecard holders were also created to establish brand identity. A limted time Twitter account was established to create buzz and inform the public of locations and details.